Dedicated to the finest bug catchers in all of Neopia. This is a tale of Lebuki, the Tyrannian Krawk, and one of his wild adventures with the bug brigade. First, allow me to introduce myself. I am Lebuki, the world's finest bug catcher! My love for bugs is what brought about my nickname, as haphazardly I would be found wandering in my sister’s bedroom and showing off my Petpetpet catch for the day exclaiming "BOO"! I really love catching bugs, too, and have found a job with the bug brigade. Armed with a net, I prowl and search for the adored bugs of Neopia, though my personal favorite is the Moach. Here is a small tale to tell you why I love the Moach so much. The bug brigade is a union that most of Neopia does not know about. These specially trained pets travel the entire world searching for Petpetpets to capture and trade at the trading post. Armed with nets and smug bug spray, they slink through the most dangerous and dirty places, searching for traces of these highly sought after pests. This tale starts with a night like any other with the bug brigade; the troops were descending into the unexplored caverns of the lost isle. We had our spelunking uniforms on, and the lights of the helmets shone across the moist stalagmites. We also had a little Lightmite in a jar for added security, since no one knew what might await us here. We were hunting for the rarest of the rare Mootix bugs that was said to hide in these dark twisted catacombs. Dripping water echoed loudly in a rat-a-tatt sound, and we tried to follow its source. My team found traces of a few Petpetpet tracks but not the particular set that they had been looking for. The Mootix was evading us and it had good cause, for as we turned the cavern tunnel opened up to a wide chamber. “Did you hear that," the Korbat asked, his voice shaking. “It sounds like something big," the answer came from the Scorchio leader. “Well, we won't know until we look," I said. The Draik just floated in the air silently offering no words, but she looked very afraid. The Lightmite's light twinkled off the cavern walls as we decided to carefully press forward through the jungle, pushing leaves aside as we continued our search. We turned and saw, to our disbelief, a massive seven foot Moach sitting in the chamber! My companions ran screaming, not even looking back. They took the Petpetpets they had so far found and boogied on out of there. I, however, did not run. I stood transfixed in amazement, staring at what stood before me: here stood the largest Petpetpet I ever did see, and it did not look happy. The Moach raised its massive claw and started after me. My heart pounded but I was frozen like a deer to headlights, unable to move a muscle. The giant female clicked its pinchers and opened its massive jaws, looking as if she was about to eat me. Inches from death, I saw my life flash before me and all the Petpetpets that had ended up as my dinner, and in that instant I understood the Moach's fear. "I am not here to capture you, my large friend," I said in a cracked voice, hoping that she could understand me. The monster looked at me, blinking its many faceted eyes. In that heart stopping moment I did not know what she might do to me for invading her home. Cautiously, I proceeded to ask her questions. “Why do you frighten everyone away?" I asked. To my surprise, she answered, "I do not wish any harm to befall my babies." She then continued, "Ever since the Petpetpets were found, we have been mistreated and misunderstood." From that moment onward, I have always been attracted to the Moach, vowing never to sell or trade them (or eat them). I have even started Neopia's first Moach sanctuary. You should see it sometime! My life has changed tenfold from that awesome experience with the mother Moach. I have turned my life around; no longer do I hunt the Petpetpets for food, though I still have a craving for the more mundane bugs and enjoy them with a bit of chocolate. There are much more important things than to hunt these little critters just for profit or for strange editable cravings. 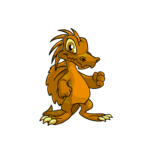 With new inspiration, I decided to open my Moach sanctuary to any Petpetpet that might need a safe zone. I convinced the bug brigade to donate extra neopoints to my cause and soon opened a large plot of land where these tiny critters could live in peace. Everything was starting to go very well indeed, except the giant friend I had made on the Lost Isle had called for help. When I got there, I found out that some poachers had started to hunt her just because she was big and intimidating. I just had to do something, so quickly I got on my gear and out into the wilderness I ran, quickly searching for my friend. Hopefully, the poachers hadn't cut her up in little pieces to sell, and what about her family? I found her in the nick of time... But how in the world was I supposed to save her? I didn't have anything of worth with me except a ring of downsize that I had gotten from the Snowager earlier in the week. Quickly I aimed the ring at the monstrous Moach, and a ray of light shot out of the gem, hitting her right in the chest. With a earth shaking cry, she screamed as she shrank in size. I knew I did not have long, so I ran to her and scooped her up into my paws. I ran as fast as I could so I could get her away from the isle before she would grow again. Far into the sea I traveled before I opened my hands and looked at the little Moach standing there. "Well now... what should I do with you?" I knew I couldn't leave her at the sanctuary, for she was the reason that it started to begin with. Looking into her large eyes, I knew that I could never leave her. "Come on, we will go to the lost city and find you a petpet you can be proud of." I had to search hard to find the Petpet I had in mind, once again in catacombs. I was looking for the rare mutant Lizark. I found him hiding in the darkened shadows, cowering away from me. “Come with me, Jamak, and together we will protect all the Petpetpets of Neopia! For there is no more terrifying group then a Krawk and his Lizark." “Click-clack," went the Moach in agreeing fashion, as I stated my declaration. I held her out and she delightedly jumped right on the Lizark. This was the beginning of the beautiful friendship between Lebuki and his companions, who continued on their quest to be the best Petpetpet defenders they could be! To this day the Moach sanctuary stands, and Lebuki, Jamak and the Moach continue their efforts to be the best they can be. A perfect union between Pet, Petpet and Petpetpet, the trio still wander Neopia rescuing bugs wherever they might be. "Where are we going? You said something about a juppie orchard in the neomail?" Neonisms: Go Ahead, Just Try It!